By chance this afternoon I came across a patch of Gahnia sieberiana , Red-fruited Saw-sedge, near Mt Wombat, loaded with ripe seed. Gahnia prefers damp to wet sites in forests, usually on sandy or silty alluvial soils. 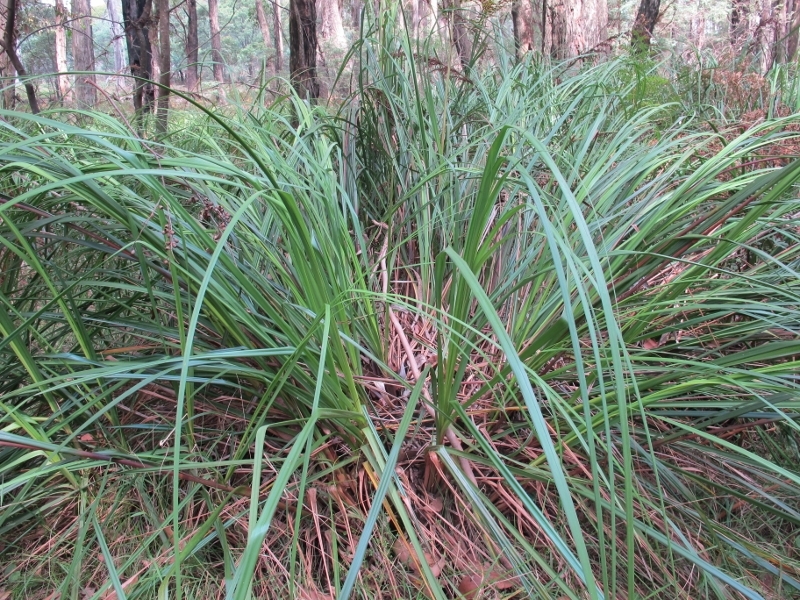 It is a tall, clumping perennial sedge with sharp, erect leaves that can reach 2.5 metres in height . 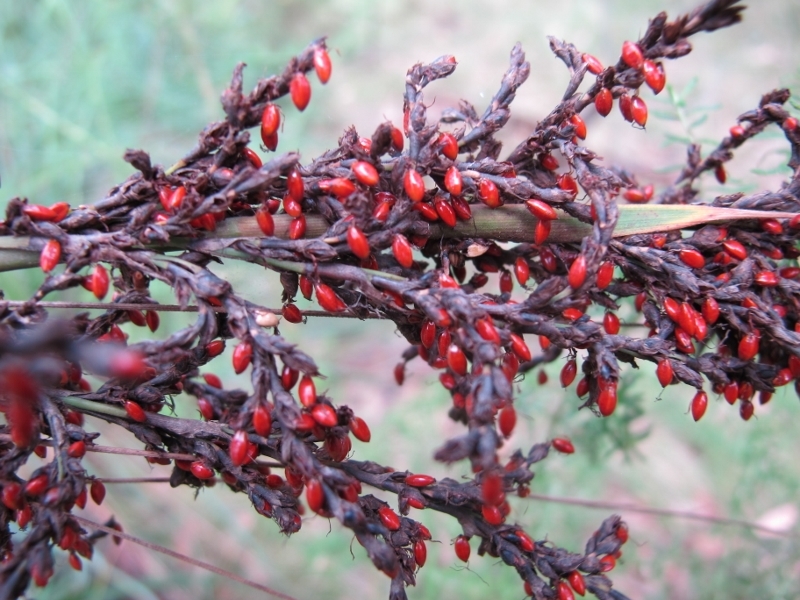 The flower stems are even taller than the leaves and were loaded with red to orange mature seeds. I have never found such quanities of mature seed before, possibly the result of favorable seasons. 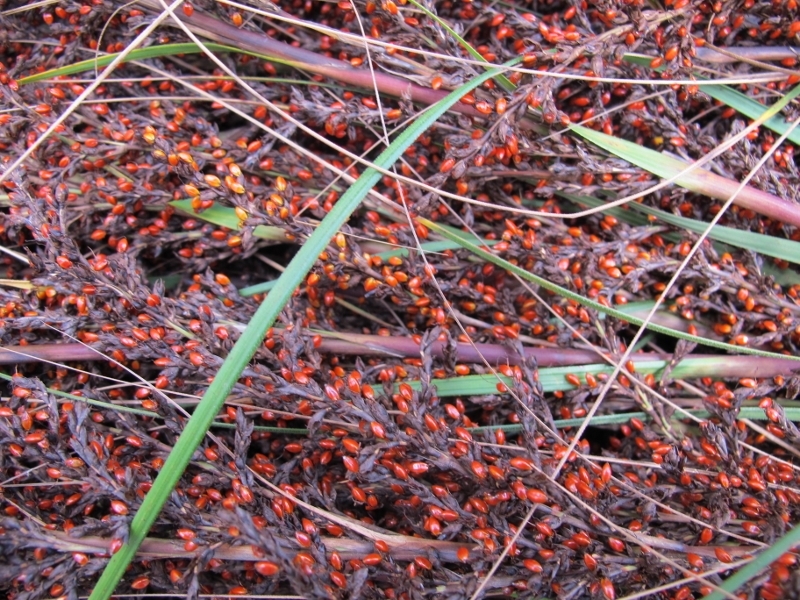 A bunch of gahnia inflorscences covered in ripe seeds. Seed collection : Cut the large seedheads at the base with secateurs. wear gloves to protect your hands from the sharp leaves .To extract the seed place the stems on a ground sheet and allow to dry thoroughly . Beat the seed from the heads. Gahnia seed has a dormancy period and will not germinate for 12 months after seed maturity. This seed also responds well to smoke water treatment to improve germination. Red-fruited Saw-sedge is a host plant for the Swordgrass Brown butterfly and I did see one of the butterflies while I was harvesting seed. Unfortunately it fluttered away before I could get a photograph.